To study and teach the Vedas. To perform sacrifice and religious ceremonies, and teach others how to perform such rituals. To accept alms and also give in charity. To offer guidance, especially to the kshatriyas. To provide medical care and general advice free of charge. To know Brahman (spirit, the self, God). To never accept paid employment. To develop all ideal qualities, especially honesty, integrity, cleanliness, purity, austerity, knowledge and wisdom. 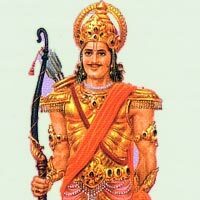 To protect the citizens from harm, especially women, children, cows, brahmins, and the elderly. To ensure that the citizens perform their prescribed duties and advance spiritually. To be the first into battle and never to flee the battlefield. To be true to their royal word. To never refuse a challenge. To develop noble qualities such as power, chivalry, and generosity. To levy taxes (from the vaishyas only) and to never accept charity under any circumstances. To take counsel, especially from the brahmins. 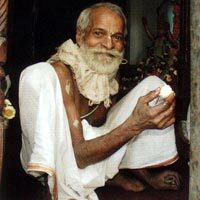 To know the scriptures, especially the artha-shastras. To deal uncompromisingly with crime and lawlessness. To take responsibility for shortcomings in their kingdom. To conquer their own minds and senses and to enjoy only according to scriptural injunction. To protect animals (especially cows), and the land. To create wealth and prosperity. To maintain workers with abundant food, clothes, etc. To give taxes to the kshatriyas (ruling class). To render service to others. To take pride in their work and to be loyal. To follow general moral principles, (e.g. not to steal). To marry (the only compulsory rite of passage). 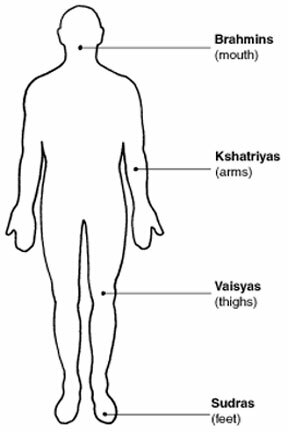 The varna system is discussed in Hindu texts, and understood as idealised human callings. The concept of varna is generally traced to the Purusha Sukta verse of the Rig Veda (ancient Indian collection of Vedic Sanskrit hymns), however modern scholarship believes that this verse was inserted at a later date, possibly to create a charter myth. According to the principle of varna, certain rights and duties accrue to an individual by virtue of belonging to a certain class in cociety. Because the specific duties and rights are predetermined for each of the four classes, once an individual’s class is known, so are his or her duties and rights. 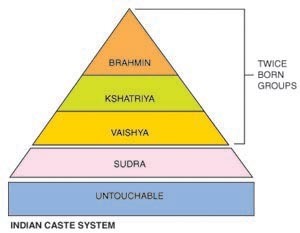 This quadruple division is an ancient stratification of society is not to be confused with the much more nuanced jati or “caste”. Jāti may be translated as caste, and refers to birth is mentioned much less often in ancient texts, where it is clearly distinguished from varna. There are four varnas but thousands of jātis. The names of jātis are usually derived from occupations, and considered to be hereditary and endogamous, but this may not always have been the case. 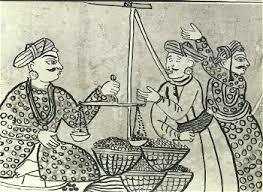 The jātis developed in post-Vedic times, possibly from crystallisation of guilds during its feudal era. 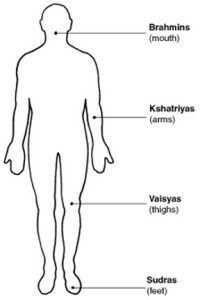 Although the varnas and jatis have pre-modern origins, the caste system as it exists today is the result of developments during the collapse of Mughal era and the British colonial regime in India. Certain groups, now known as Dalits, were historically excluded from the varna system altogether, and are still ostracised as untouchables. The Vedic texts neither mention the concept of untouchable people nor any practice of untouchability. Later Vedic texts ridicule some professions, but the concept of untouchability is not found in them. The post-Vedic texts, particularly Manusmriti mentions outcastes and suggests that they be ostracised. Recent scholarship states that the discussion of outcastes in post-Vedic texts is different from the system widely discussed in colonial era Indian literature and state that ancient and medieval Indian texts do not support the ritual pollution, purity-impurity premise. They state that purity-impurity is discussed in the Dharma-sastra texts, but only in the context of the individual’s moral, ritual and biological pollution (eating certain kinds of food such as meat, going to bathroom and that the overwhelming focus in matters relating to purity/impurity in the Dharma-sastra texts concerns “individuals irrespective of their varna affiliation” and all four varnas could attain purity or impurity by the content of their character, ethical intent, actions, innocence or ignorance (acts by children), stipulations, and ritualistic behaviours.In short, they acknowledged that ancient varna hierarchy was not based on purity-impurity ranking principle, and that the Vedic literature is devoid of untouchability concept.